Corporate responsibilities (CR) have recently gained attention in developing countries, such as Malaysia. CR are expected to be a vital practice of Islamic Financial Institutions (IFIs) since they are described as “having a social face”. The communication of CR information by Islamic Financial Institutions (IFIs) has been of interest to the accounting information users. The annual reports of the selected IFIs are analysed to identify the types of CR information as well as the volume of information disclosed. It is found that there is a communication gap between the actual communication made by IFIs and the “desirables”, as prescribed in Shariah. MUHAMAD, Rusnah; MD RAHIN, Nurliana. 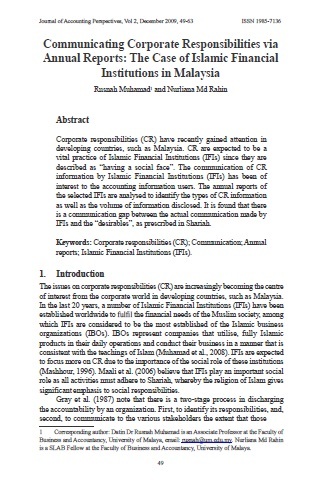 Communicating Corporate Responsibilities via Annual Reports: The Case of Islamic Financial Institutions in Malaysia. Asian Journal of Accounting Perspectives, [S.l. ], v. 2, n. 1, p. 49-63, dec. 2009. ISSN 0128-0384. Available at: <https://ajap.um.edu.my/article/view/3645>. Date accessed: 23 apr. 2019.